Barcelona was a pioneering city in implementing measures to promote the installation of solar-energy systems; so, 1999 saw the approval of the Barcelona Solar Thermal Bye-law, compliance with which became mandatory as from August 2000. The balance from all these years enabled the city to process over 100,000 m2 of surface area for capturing solar radiation and which can generate an annual power of 71,000 MWh. Close to 60 % of this surface area is found in housing blocks. 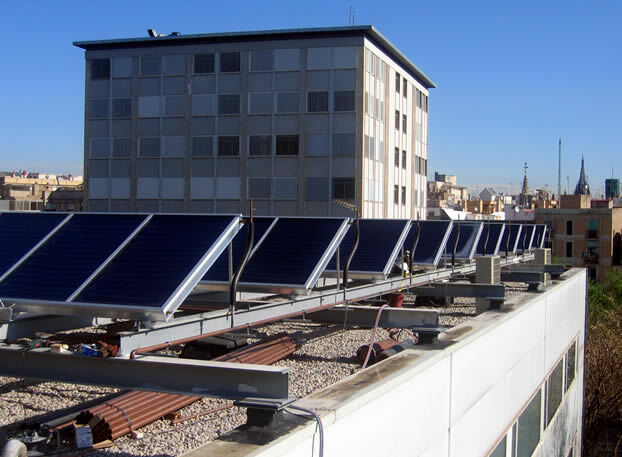 Under the terms of Title 8, on Solar Energy, of the Barcelona Environment Bye-law, published in the BOPB on 2 May 2011 it is compulsory to plan systems for harnessing solar energy to produce sanitary hot water and electricity in new or renovated buildings or buildings whose uses have undergone comprehensive changes. The Comprehensive Barcelona Solar Bye-law Manager (GIOS) is an online tool aimed at the sector's professionals, to help them to develop thermal and photovoltaic solar-energy installation projects. It also simplifies procedures for obtaining the corresponding municipal licences, according to the process set out in the Solar Bye-law.